The Armorgard Mobile Grit Bin is ideal for moving grit to a required location. It is manufactured from high density plastic to ensure maximum durability of the product. It has a storage capacity of 75 litres, and a strong lockable clasp for securing the contents. 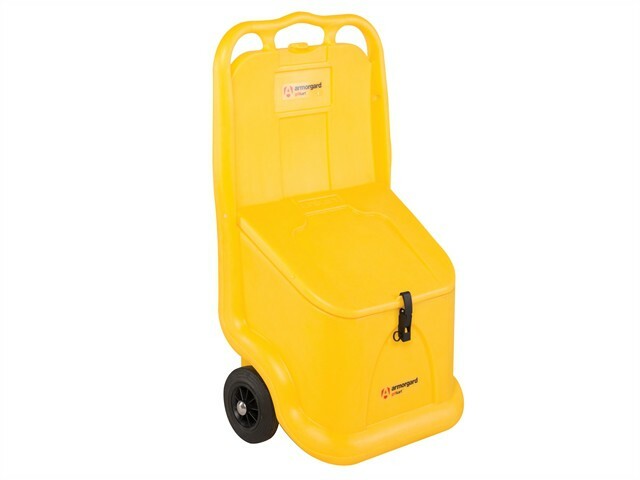 The Mobile Grit Bin has lid clips to hold the lid in the open position, and shatterproof wheels for the ultimate pulling experience. When it is closed the lid is sealed tight to prevent water penetration. The grit bin helps prevent wastage, theft and misuse of grit. Doesn't include the grit or scoop. Size: 590 x 400 x 1080mm.